Classic SciFi RPG style play. 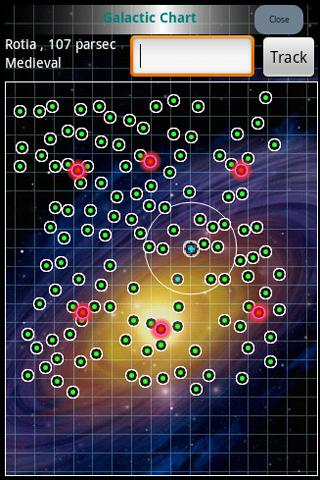 Design yourcharacter and warp around a Universe with over 100 systems. If youlove SciFi like Star Wars, Star Trek, Serenity, Firefly, BattlestarGalactica, or Babylon 5 you'll probably love Dark Nova!. Open ended RPG gameplay inspired by classic space games like Elite,Privateer, Star Control, EV Nova, Sundog, Freelancer, Starflightand more! Be a Trader, Pirate, Smuggler, maybe a Bounty Hunter. Build yourship and your skills and follow your destiny! 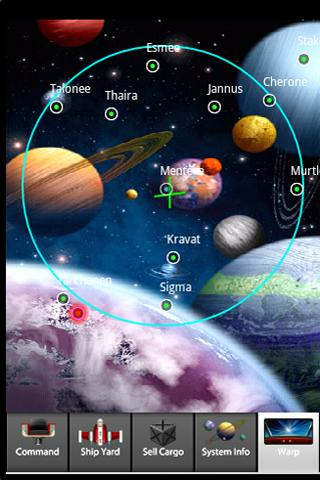 Trek through thestars on quests and adventures. 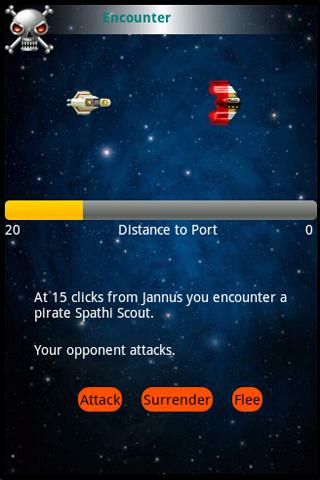 Trade in space and at ports!Encounter mysterious alien races. Transport passengers but bewaresome may bring unwanted attention to you. Dark Nova is the official conversion of the classic Palm Pilot gameSpace Trader with new graphical, sound, and gameplay content. ***Thanks to everyone who has emailed us with suggestions! We areconstantly working to improve the app! Please Visit http://darknova.net and send us yoursuggestions. ATTENTION! THIS GAME IS MEANT TO BE PLAYED WITH FRIENDS IN PERSON.IF YOU ARE ALONE YOU CANNOT PLAY! Dark Stories is an easy to playand fun game but some of the stories are quite difficult. All thestories are fictional. To solve them, the players will need toprove their skills as detectives. HOW TO PLAY Dark Stories must beplayed in group. A person -chosen as narrator- picks a mystery andreads its description aloud. Then he/she reads its solution withouttelling the other people. The rest of the players then have to makequestions in order to solve the mystery. The narrator can onlyanswer the questions using "Yes", "No" or "It is not relevant". Theonly possible solution is the one given at the back of each mysterycard. If the answer is still not clear enough, the players mustfollow the narrator's interpretation of the mystery. EXAMPLE Atypical fragment of a gameplay could be: Player1: "Did he diebecause of the shot?" Narrator:"No" Player2: "Was he poisoned? "Narrator: "No" Player3: "Did he have children?" Narrator: "It's notrelevant" Player1: "Are there other people in the story?" Narrator:"No" Player2: "Did he commit suicide?" Narrator: "Yes" ... END OFTHE GAME When the narrator considers that the story has been solvedenough, the narrator can conclude the game and read the wholesolution. It is up to the narrator to give some clues if the storyis in a deadlock. WHEN TO PLAY It is perfect for birthday parties,camps... and every situation in which you join several friends.STORIES This free App includes more than 160 stories and we willadd new stories periodically. Accidents, suicides, thefts... Willyou be able to solve every mystery? PERMISSIONS This app uses theWRITE_EXTERNAL_STORAGE permission. It is needed to take screenshotsthat you can share. This is done always with your previous consent.If you don't give the app this permission, you can still use it butyou will not be able to share screenshots from the app. Specialthanks to Lorena Rebollo, mcwc307 Chan, Rachel Long and ZakFreckelton for their help with the English translation. A small speck of light inside a dark, dark… something. Looks like ahall, but the walls, if there are any, are not reflecting anylight. Somehow you can recognize where the light ends. There is ahum. Going slowly forward and after a couple of meters I turnright… A dead end. I go back, go left… Another dead end. I slowlyrealize that I am in a maze, and there is probably only one wayout. And what is that hum?! Minutes go buy the dark is taking it'stoll. I start seeing things that are not there, or are they? Thathum sometimes gets louder and sometimes I can barely hear it. Maybethat is the way out. Follow it. I go back, turn the corner, andanother one. Suddenly a loud sound hits me, it sounds like somesort of a machine, can't be sure. A dark cloud is heading my waywith incredible speed. Can't see the particles of the cloud, it isperfectly black like the walls, but its surface moving,transforming. Run! Turn a corner, another one, bumping walls Icannot see. The sound is not that loud any more. I think I escaped,for now. But it is moving. Definitely moving.Minutes pass. Tryingto avoid the dark cloud. I'm probably going in circles. Think I seea light that is not mine. I run to it. So much light it's blinding!Step into it, this must be a way out! So blinding!Wake up… A smallspeck of light inside a dark, dark… maze.Player is a small ball oflight in a dark maze. The only light source is the player itself.Nothing reflects light. Be wary of the shadows that lurk inside themaze. They can extinguish your light. Play 48 (and more are on theway) maze designs. Touch anywhere on the screen and move yourfinger in the direction you wish to move. On the right side of thescreen you have two power-up buttons you can use. Try not to hitthe walls. If you do it hard enough you will be temporarilyincapacitated. Get out of the maze as fast as you can. You willrecognize the exit by the bright white light. Explore the Final Frontier as the Star Trek ™ franchise comes tolife in this official RPG puzzle game! Join the Federation in thisstarship strategy game that combines your favourite Star Trek ™characters from The Original Series and The Next Generation,together with spacecraft battles, PVP combats, versus tournaments,and deep RPG levelling. Take part in the space battlefront, make anew galaxy discovery, and become a hero of the Universe!Collectcards to explore the ever-growing Star Trek ™ database with newcrew members, tiers and ships. Will you collect them all? Discoverthe official Star Trek ™ game and become a true Trekkie!With deepRPG, recruit and evolve your favourite characters from TOS and TNGto create the greatest crew in Starfleet history! Will you needJean-Luc Picard’s leadership, or Worf’s power? Exploit CommanderSpock’s logic, Leonard McCoy’s medical experience and the courageof Captain James T. Kirk to assemble an epic crew and defeatgalactic enemies to become heroes of the Universe.Destroy alienvillains in starship battles, one-on-one space combat, anddiplomatic clashes. Strategize the unique abilities of your troopsand Starfleet to show your opponents that resistance is futile.Match gems and battle for the Galaxy against new lifeforms andtheir spacecrafts, like the Borg, Ferengi, Klingons andVulcans!Complete timeline quests, challenge your friends, andachieve the highest rank in exclusive tournaments and weekly versusevents! Unlock new characters and ships, and win the greatestprizes and experience in limited space missions. Lead your heroesto victory in the best Star ships like the Enterprise, Voyager,Defiant and many more!Craft the finest strategy to slay yourenemies in legendary, RPG-style clashes and become the mostmythical commander in this Stardate. Starfleet has chosen you, sojoin the Federation, take command of your starship and discover theofficial Star Trek ™ experience in this puzzle quest game!🖖 GAMEFEATURES 🖖STAR TREK ™ OFFICIAL CONTENTPlay with your favouritecharacters, ships, and alien races from TOS and TNG!Discoverlegends like Uhura, Scott or Sulu, and help them on thebattlefront.Boldly go where no man has gone before, and be theultimate Trekkie!TRADING CARD SYSTEMFind booster packs, anddiscover new characters and spaceships to complete your hangar.Winspecial packs and form your crew with original members, withspecial skills and talents.ROLE PLAYING GAMEEvolve your crew andstarships and gain new abilities!Level up your team throughout thegame to be the best squad ever!Unlock incredible and unique powers,skills, and talents for each hero!DETERMINE YOUR CREW ANDSTARFLEETSelect your troops wisely and send them to epic duels andexciting missions.Fill your hangar with your favourite spaceshipsand use them in space wars: Romulan, Klingon Bird of Prey, USSEnterprise and many more!THREE WARFARE MODESThrilling interstellarspaceship wars, amazing one-on-one combat, and diplomaticencounters between heroes of the Galaxy!Will you lead your team tovictory and conquer the cosmos?STORY, EVENT AND VERSUSMODEExperience different CAMPAIGNS with unseen adventures andquests from both series: TOS and TNG! What new discovery of theuniverse will you make?Weekly EVENTS and tournaments! Challengeyour friends and win exclusive prizes!Battle players from aroundthe Universe in VERSUS Mode and reach the top of the rankings!StarTrek ™ is back, and you can become captain of your own ship in thisRPG puzzle quest game! Download for free now and beam yourself upinto a discovery of new worlds!JOINUS:http://facebook.com/StarTrekWOGLive Long and Prosper! 2048 Dark is a dark themed version of the classical 2048 puzzlegame.You can play 2048 dark game by joining tiles with the samenumbers to convert them to another tile which has a value as thesum of the tiles joined (ie. 2+2=4, 4+4=8, 8+8=16 ..) Your aim inthe game is to reach a 2048 tile by joining two 1024 tiles. Whenyou reach 2048 you win the game but you can choose to continue forhigher points. The Dark Rooms is a stylish new puzzle game that requires you tothink differentlyAttempt to complete each puzzle but without anyidea how to do it! The game starts you off easy but progresses toinsane puzzlesThink differently to pass each stylish level, useswipe, tap, touch, pinch, drag and more as you attempt to find thesolutionWith its stylish look and feel and seemingly endless amountof levels you will be playing The Dark Rooms for hours tocomeDownload and enjoy this new addicting genre now!